Let the “Ohhh’s and Ahhh’s” begin! 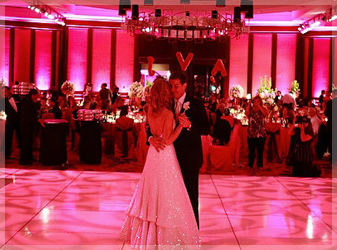 Accent Lighting is a great way to enhance the ambiance of your reception and to surround your guests with any color from your wedding. 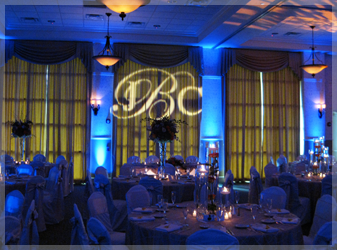 Whether you are hosting your reception in a conference room, club house or the most elegant ballroom in town, you now have the ability to take your decorating to the next level. L.E.D. Accent Lighting is available in two different packages. We welcome the opportunity to explain the benefits of each package based on your needs. The lighting packages we offer are listed below. We offer multiple colors to choose from, L.E.D. features Battery Power, Low Watts and NO heat. 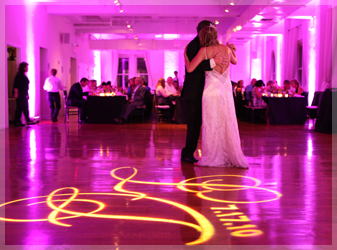 Nothing personalizes your wedding more then a Dancefloor Monogram. With this option you and your guests will see your name in lights. 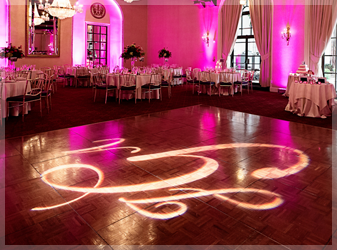 The Dancefloor Monogram will also add to the decoration of your reception and highlight your first dance. You can choose to use your names, initials or custom design the monogram. Feel free to contact us to learn more. Thank you for making our dreams come true… You listened to our wants and made them a reality. The ballroom was more beautiful then I could have ever imagined. Even the hall manager commented that she has never seen the room look so great! We knew that the lights were going to make our room look nice, but I could have never imagined the way I felt when the doors opened and I saw what you did for us! Thank you for recommending more lights for the room, it was PERFECT! Everyone was shocked to see how beautiful our reception was. We have received so many compliments on the accent lighting and monogram. Thank you for making our room look awesome! My sister is getting married next summer and she is going to call you on Monday! The lighting you did for us looked so nice that the hall owner asked if he could use pictures from our wedding to advertise on his website! Everyone was blown away! Thanks for making our day the best day ever!